Jews have lived in Ireland for centuries. The earliest reference is in the Annals of Innisfallen, a chronicle of medeival Irish history, in the year 1079, that states, “five Jews came from over the sea with gifts to Tairdelbach [king of Munster] and then were sent back again over the sea.” Today, the Jewish community of Ireland numbers approximately 2,557, with almost 2/3 living in Dublin. Between 2011 and 2016 the Jewish population of Ireland increased by 30%, which officials attributed to an influx of young professionals working with U.S.-based multi-national firms that have set up offices in Ireland. The Annals of Innisfallen, a chronicle of Ireland’s medieval history written by monks, reveals the island had Jewish residents as far back as 1079. Following the expulsion of the Jews from Portugal in 1496, some Jews made their way to the South coast. In the town of Youghal in Cork County, the the first Jewish Mayor in Ireland, Mr. William Annyas, was elected in 1555. In later years, Mr. Robert Briscoe was elected Lord Mayor of Dublin in 1956 and 1961, his son Mr. Ben Briscoe in 1988, and Mr. Gerald Goldberg, Lord Mayor of Cork, in 1977. In 1660, the earliest recorded synagogue was established, consisting of a prayer room in Crane Lane, opposite Dublin Castle. The oldest Jewish cemetery dates from the early 1700s, and is situated near Ballybough Bridge, Clontarf, Dublin 3. Many Jews did not arrive in Ireland on purpose, disembarking ships early believing they had reached America or simply being tricked by ship captains. Small numbers of Jews came and went between tne 12th and 18th centuries, but by the beginning of the 19th century, the Jewish community had dwindled to just three families. Jewish immigration picked up in the 1820s, mainly from England, Germany, and Poland. Following the end of the Napoleonic Wars, there was some Jewish immigration from Central Europe. By 1880, over 450 Jews had settled in Dublin. They spoke English and were very prosperous. There was a synagogue on Mary’s Abbey, just north of the River Liffey. Lithuanian Jews began arriving in 1881, and by 1900, Dublin was home to more than 3,000 Jews. The largest influx of Jews occured between 1880 and 1910, when approximately 2,000 Jews arrived from Eastern Europe and settled mainly in Dublin, with smaller numbers settling in Belfast, Cork, Derry, Drogheda, Limerick, Lurgan, Londonberry and Waterford. They engaged in trade, manufacturing, and other professions. In Dublin, the Lithuanian Jews settled south of the center, in an area that was eventually dubbed “Little Jerusalem.” Many of the immigrants became peddlers, petty traders and moneylenders. The second-generation would eventually go on to become a major force in the manufacture of clothing and furniture. The Limerick community dissipated after the so-called Limerick Pogrom in 1904, essentially an anti-Jewish economic boycott rather than a physical attack. It was the only blatant, organized anti-Semitic incident in modern Irish history, according to an article in the JTA. Only a handful of Jews came during the Nazi period and shortly after the end of World War II. Ireland remained neutral during this time. The Jews of Ireland had a silver age, when their population peaked at approximately 5,500 during 1880 to the end of the 1940s. The numbers have since declined to about 1,700, but the the Jewish population is slowly growing for the first time in 50 years. After World War II, slow economic growth and the tendency for young people to study abroad took a heavy toll on the Jewish community. Ninety percent of those who left settled in Britain, Israel and the United States. Since the mid-1990s, as Ireland’s economy began to grow, a small number of Israelis, Americans and South Africans have started to return. About 1,300 Jews reside in Dublin today and another 400 are scattered about the country. Most now live beyong the Grand Canal, which is the southern border of Little Jerusalem, to the south Dublin neighborhoods of Terenure, Rathmines and Rathgar. Today, many are doctors, laywers and university professors, although some still own retail shops. The community has a mikvah, a bakery and a Jewish day school called Stratford College that also has many non-Jews among its student body and faculty. There used to be 11 kosher butcher shops in Dublin, but now kosher meat has to be shipped in from England. Dublin Hebrew Congregation on Rathfarham Road in Terenure is the largest of the three, and is the seat of Irelans’s chief rabbi (currently Yaakov Pearlman). It follows the Orthodox tradition, with a tendency towards the modern Orthodox. Orthodox Machzikei Hadass is at the rear of 77 Terenure Road North and is more traditional. Dublin Jewish Progressive Congregation is at 7 Leicester Avenue in Rathgar and is more liberal. Dublin Hebrew Congregation’s historic Adelaide Road Synagogue was de-consecrated because the community had shrunk so much it could no longer maintain two traditional congregations. Although Cork was once home to some 400 Jews, it now only boasts a population of five. However, at least three times a year, for Passover, the High Holidays, and Hanukkah, Jewish life in Cork becomes vibrant once again, as the synagogue founded in 1893 fills with as many as 100 people. Cork’s synagogue is located at 10 South Terrace and was built in 1896. Shalom Park, directly in front of the Hibernian Buildings along Albert Road, honors the street’s Jewish history, although the last Jewish family moved out over 30 years ago. It was dedicated in 1989. Thirteen graves at a Jewish cemetery in Belfast were damaged, vandalized, and broken on August 26, 2016. Henry McDonald, a journalist with the Belfast Telegraph, reported that, “the vandals used hammers and blocks to break up the headstones, while a larger mob looked on encouraging their actions. There is clear evidence here of forward-planning... it is undoubtedly the case that the desecration was motivated by anti-Jew hatred” (Algemeiner, August 30, 2016). The Democratic Unionist Party (DUP) joined the coalition with Theresa May's Conservative Party in June 2017 to help her form a government, which bodes well for ties with Israel. Northern Ireland’s DUP Members of Parliament are amongst the staunchest supporters of Israel in the House of Commons. According to Steven Jaffe, Christian Zionism is a potent force amongst Ulster’s church-going Protestant community, the traditional heartland of DUP support. Irish airline Ryanair tripled their amount of flight options to Israel in February 2016 with the addition of 15 new flight routes, including 7 new routes to Tel Aviv. Members of the Dublin City Council elected to fly the Palestinian flag outside of Dublin City Hall for one month in May 2017 following a heated debate. The decision to fly the flag in solidarity with the Palestinian people was approved after a vote of 42 members in favor out of 63 total. An amendment to the proposal, which would have seen both the Israeli and Palestinian flags flown outside Dublin City Hall, was defeated, with 43 members of the City Council voting against it. Israel’s first ambassador to Ireland arrived in 1994. Since 1948, 673 Irish Jews have immigrated to Israel. Prior to the 19th century, no record existed of a significant Jewish settlement in Northern Ireland. There was, however, at least one Jew residing in Belfast in the year 1652, a tailor named Manuel Lightfoot. Around 1845, Mr. Daniel Jaffe, a merchant from Hamburg, visited Belfast to establishing contacts in the sale of linens. Within the next decade, he established three Jaffe Brothers, George Betzold & Company and Moore & Weinberg linen houses in Belfast. During this time the Dublin Jewish minister was the Rev. Julius Sandheim. In his Register of Births, the earliest recorded Jewish birth was a male child born in 1849 to Meir Levy. 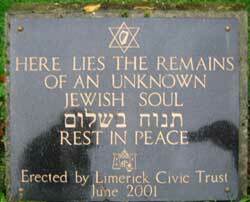 Grave of an unknown Jewish person in Castletroy, Limerick. By the year 1869, the number of Jewish residents in Belfast had grown to twenty-one. In the following year, a synagogue in Great Victoria Street was founded by Mr. Jaffe, Mr. Weinberg, Mr. Betzhold, Mr. Boas, Mr. Lippman and Mr. Portheim. The project was funded by Mr. Daniel Jaffe. Rev. 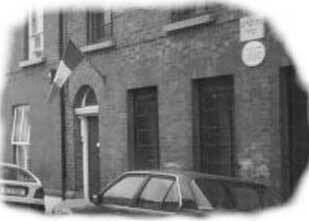 Dr. Joseph Chotzner officiated and conducted Hebrew and religion classes for the Jewish children of Belfast at his home in 71 Great Victoria Street. In 1891, 282 Jews lived in Northern Ireland, 205 of whom were located in Belfast, and five in Londonderry. The introduction by the Russian Parliament of the “May Laws” in 1882, caused an exodus of Russian Jewry fleeing Tsarist oppression. A sprinkling of such fugitives found their way to Belfast. The Belfast Hebrew Board of Guardians was then formed by Mr. Max Veital in 1893 Mr. Veital, along with a Mr. Cohen, was also instrumental in founding the Belfast Chevra Kadisha, or the Belfast Holy Burial Society. In 1896, a Belfast Hebrew Ladies Foreign Benevolent Society was created. By 1901, 708 Jews resided in Belfast, 58 in Londonderry, and 899 in all of Ulster. The several Russian Jewish families that arrived in Belfast were given a safe haven from the pogroms and vicious persecution of their homeland. Despite economic hardships, these families managed to rent a small house in the Carlisle Circus, New Lodge Road and Lower Antrim Road area. They were kindly received by the local inhabitants and, shortly afterwards, established a prayer house on Jackson Street. With an increase in childbirth, the Regent Street School was soon established at the rear of the present Clifton Street Orange Hall. 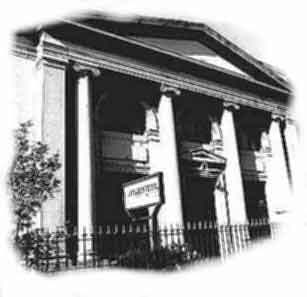 The Greenville Hall Synagogue, located on Annesley Street, opened in 1904, after a significant donation from Sir Otto Jaffe, president of the community and Lord Mayor of Belfast. Three years later, the Jaffe Public Elementary School at the corner of Cliftonville and Antrim Road was founded. One of the most renowned figures of the early part of the 20th century was Rabbi Jacob Shachter, who officiated the synagogue from 1926 until 1953. Rabbi Dr. Isaac Herzog, known as the “Sinn Féin Rabbi,” was appointed the first Chief Rabbi of the Irish Free State. From 1937 until his death in 1959, was the Ashkenazi chief rabbi of British Mandate Palestine and Israel. His son, Chaim, Israel’s sixth president, was born in Belfast in 1918. Barney Hurwitz, the long-serving President of the Belfast Hebrew Congregation, was appointed a Justice of the Peace and honoured by the OBE. Louis Hyman also was appointed Justice of Peace. Jackie Morris was declared His Excellency the Israel Ambassador to New Zealand after having served as the consul in New York. In 1907, the National School for Jewish Children was established. A children’s hostel opened on Clifton Park Avenue during the Second World War and a Millisle farm served as a refuge for children escaping the war. Ireland’s total Jewish population increased by 7.8 percent from the 2002 to the 2006 government census, rising by 140 to 1,930. The Jewish community’s growth is due largely to the country's general immigration boom. Foreign residents now make up 10 percent of Ireland’s population. Jewish immigrants from Israel, South Africa, North America, and Eastern Europe have contributed substantially to the growth of Ireland’s Jewish community since the 1990s. Jewish Population in Ireland Rises by 30%, Much to Surprise of Local Community, Haaretz, (October 14, 2017).